The Frigidaire FFPS4533QM is a small refrigerator with a dedicated freezer compartment that works just as well as a full-sized model. 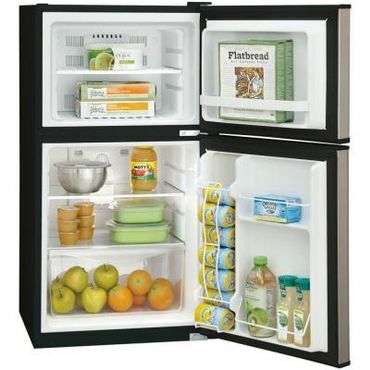 The Danby DCR044A2WDD is a refrigerator-only that would be great for a dorm room. We also feature notable runners-up from GE, Igloo and, new in this year's report, Midea. The 4.5-cubic-foot Frigidaire FFPS4533QM earns praise from owners for its top performance at both chilling food and freezing it, thanks to the separately insulated freezer compartment with its own door. The Frigidaire FFPS4533QM is also quiet enough to operate in enclosed places, and users love the adjustable glass shelves, enclosed crisper bin, tall bottle storage in the door, auto-defrost function, and automatic interior lighting. The Frigidaire FFPS4533QM's is backed by a one-year warranty. The Danby DAR026A1BDD makes the most of its limited space by eschewing a freezer compartment. Instead, you get the entire 2.6 cubic feet of storage space for efficient refrigeration, as long as you leave the proper airspace behind and to either side of the refrigerator. Three adjustable shelves, a can rack, and a door shelf that holds one tall bottle help you stay organized. This mini fridge comes in a variety of other sizes and colors. If you need to chill food in a dorm room or RV, stock cool drinks in the wet bar or a basement rec room, or find a way for teens to keep their food away from nosey siblings, you might want to consider a mini fridge. The compact appliances are small enough to slip into places where a full-size fridge couldn't possibly fit, and many also have tiny freezer compartments that can hold ice for your wet bar or, in a few cases, have room for frozen pizzas. Mini fridges aren't known for their stellar freezing performance, though, and cold air leaking out of the freezer compartment can sometimes damage delicate foods. Many also don't have the ability to keep frozen foods at a safe temperature. In general, it's best to focus on letting that mini fridge do its one job -- keep unfrozen foods cool -- or to purchase a small fridge that has a separate door for the freezer compartment. That means the freezer is isolated from the fridge and better insulated overall, so your frozen items stay frozen and chilled foods aren't damaged by leaking cold air. You can also purchase mini fridges that don't have a freezer compartment at all, which maximizes your refrigerator space and eliminates the worry about cold air going places it doesn't belong. If you really need extra freezing capacity, you're usually best served by purchasing a dedicated stand-alone freezer; we recommend the top choices in all sizes in a separate report. Some people use mini fridges to store wine or champagne, but if you are serious about fine wine, you should consider getting a wine cooler instead. And, of course, a mini fridge can't replace a full sized refrigerator, so if your big fridge is on the fritz, head over to our latest edition of that report for some great recommendations. Higher-quality mini fridges use compressors to regulate temperature, just like full-size refrigerators do. Cheaper models rely on thermoelectric (Peltier) coolers, which use electrical currents to produce their cooling effect. Generally speaking, mini fridges that use thermoelectric cooling are sufficient for chilling drinks, but little else. They cannot maintain temperatures below 40 degrees Fahrenheit, the U.S. Department of Agriculture's threshold for safe food storage. It's important to know which type of cooling system a given fridge has before you purchase, especially if you plan to store food in it. Most thermoelectric mini fridges are identified as such on their packaging. (They may also be described as "superconductor" refrigerators.) If you're not sure, check the product specs: If they state that the unit cools a certain number of degrees below ambient temperature, or that it must be unplugged intermittently, it's a thermoelectric style fridge. All of the models in this report use compressors. Most well-known manufacturers of large refrigerators produce compact models, too; but they don't always perform well. In fact, little-known manufacturer Danby has done very well in this report for a couple of years running. However, the top spot for a larger (though still compact) fridge in this year's report goes to a model from a well-known manufacturer: the 4.5-cubic foot, Energy-Star-rated Frigidaire FFPS4533QM (Est. $330). The kudos are well earned. This Frigidaire does a great job of balancing every aspect that users value in their mini fridges: It's reasonably compact, quiet enough to operate in enclosed spaces and, most important of all, it keeps your food consistently cold. Users say temperature adjustments (between 32 and 50 degrees) are easy, and they love having a second, separate door for the full-width freezer compartment. Speaking of the freezer compartment, the Frigidaire FFPS4533QM's compartment is large enough to have a single, adjustable shelf in it -- and the fact that it's completely separate from the refrigerator compartment means you don't have to worry about items placed on the top shelf of the fridge suffering freezer burn or other damage from cold air leaking out of an in-fridge freezer compartment. This is the only model we evaluated that performed well at both refrigeration and freezing, and users love its auto-defrost function -- not a terribly common feature on mini fridges. The main refrigeration compartment has two adjustable glass shelves, an enclosed crisper bin to keep produce fresh, storage for cans and tall bottles in the door, and interior lighting. One user says there's enough space to store a week's worth of groceries in the refrigeration compartment. Because of its excellent chilling and freezing performance, this mini fridge can do anything: holding food in a dorm room or teenager's room, stocking ice and cold drinks for a wet bar, or even functioning as a standalone fridge for a small rental unit. The only real criticisms we found of the Frigidaire FFTPS4533QM are some mixed reviews of its durability. The manufacturer estimates that it uses 259 kWh/year, and it's backed by a limited one-year warranty. The Frigidaire FFTPS4533QM is an excellent value. But if you're on a stricter budget, we like the 4.4-cubic-foot Danby DCR044A2WDD (Est. $150). It's Energy Star rated, with an estimated energy consumption of 226 kWh/year, and similar internal storage: Three glass shelves (two that adjust), plus storage for cans and tall bottles in the door. That storage design is a big part of why this mini fridge won a top pick from TheSweetHome.com after hands-on testing. The Danby DCR044A2WDD also has a small full-width freezer compartment but, because that freezer compartment doesn't have its own door, it shares air space with the rest of the refrigerator. As expected, users say this little unit has trouble keeping ice cream hard-frozen, and cold air leaking out can freeze produce that's placed on the top shelf. There's an open cavity meant for produce in the very bottom of the fridge, but it doesn't actually have a produce bin. Users also note the lack of an interior light. With that said, the Danby DCR044A2WDD does pretty well where it matters the most -- the actual refrigeration -- as long as you follow the manufacturer's instructions carefully. You should plug the Danby in for 24 hours before filling it with food, and leave several inches of air space to the sides and back. If you do this, users say this mini fridge runs fairly quietly and does a pretty good job of keeping your drinks or food chilled. In fact, the magnetic door seals so tightly that you might have to put a paper clip in the seal to make it easier to open. Reviews are just mixed enough, however, that if you're planning to store raw meat or other food that must be maintained at less than 40 degrees, you should plan on investing in a refrigerator thermometer to verify that the thermostat is actually doing its job (its temperature range is supposed to be 32 to 50 degrees). Also, although the Danby DCR044A2WDD is backed by an eighteen-month warranty, users say customer service usually offers refund checks instead of repairing or replacing the unit. If your biggest concern is making the most of limited space, another excellent mini fridge is the 5.6-cubic-foot, Energy-Star-rated GE GCE06GGHWW Compact Refrigerator (Est. $360). It has the standard mini fridge organization (two adjustable glass shelves plus a clear crisper drawer, door shelves and a can rack) plus interior lighting and a small, full-width freezer compartment. This version is white, but it also comes in stainless steel as the GE GCE06GSHSB Compact Refrigerator (Est. $380). Users say the GE mini fridge is very quiet and it can be used as a freestanding appliance or built in to the under-counter space meant for a dishwasher. It does a great job of keeping food and drinks cool, although once fully loaded it takes a while to get back down to its ideal operating temperature. Like the Danby DCR044A2WDD, the GE GCE06GGHWW's freezer compartment shares airspace with the refrigeration compartment, so it struggles to freeze full-size ice cubes (although the smaller ice cube trays it come with are said to work pretty well). Users are also put off by the need to manually defrost the freezer compartment every few months; those two characteristics are enough to keep the GE from displacing the Frigidaire FFPS4533QM from its top spot. Still, when it comes to maximizing storage, the GE's 5.6-cubic-foot capacity is hard to beat. It's covered by a one-year limited warranty. The smallest mini fridges (sometimes called cube fridges) are good for keeping beverages cool and sometimes storing a small lunch, but not much else. Many of these models are small enough to fit under a desk and inexpensive, but they also tend to be made of cheap components that leave them inefficient and unreliable. One notable exception to this field is the Energy-Star-rated 2.6-cubic-foot Danby DAR026A1BDD (Est. $140), which has three adjustable glass shelves, a can rack, and a door shelf that'll hold one tall bottle. Users say this mini fridge does a good job of keeping things cool, and because it has no freezer compartment, there's more room for storing food and drinking inside. (An auto defrost function takes care of any ice that might build up.) It's also relatively quiet, most say. However, delicate items like lettuce may freeze if you put them toward the back of the fridge, where it tends to be cooler, and the lack of air circulation means you can get a lot of temperature variation when it's fully loaded. Upsizing your Danby DAR026A1BDD by just a little bit can help; the extra room allows better air circulation, which in turn helps maintain consistent temperatures. You can get the same fridge in several larger capacities: 3.1 cubic feet, 3.2 cubic feet, 3.3 cubic feet and 4.4 cubic feet, many of which eschew freezer compartments in order to offer you the most refrigerator space possible. It even comes in a tiny 1.7 cubic foot model. This fridge is also available in several bold colors -- red, black, white and stainless steel -- and you can get the 3.2 cubic foot fridge in a patriotic, Budweiser-branded version emblazoned with red, white and blue elements from the American flag. The Danby DAR026A1BDD is backed by the company's 18-month warranty, although you'd have to transport it to the repair shop -- but owners say the company is more likely to issue a refund than pay for repairs. Like larger Danby fridges, this unit is meant for freestanding use only -- it needs at least five inches of open space on the back for air circulation, and a couple inches on the sides. Freezer compartments on tiny, cube-shaped mini fridges are typically even worse than on large mini fridges, if only because there's less space for storing your delicate produce or drinks away from the freezing compartment. If you must have a freezer compartment for storing ice, though, the Igloo RFR-115 (Est. 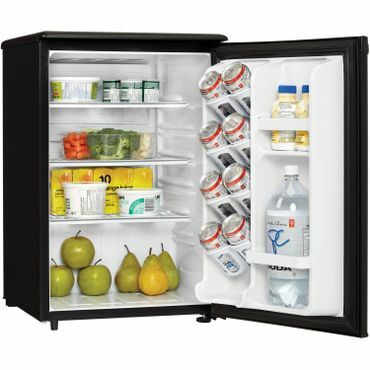 $90) offers a half-width compartment that still leaves room for a tall bottle on one side of the fridge compartment. Its door basket is large enough to hold a 2-liter pop bottle, too, and the wire shelves slide out for easy access. On the downside, users say it's too loud for use in living areas (put it in the garage instead). It's also not particularly energy efficient, and not terribly durable either -- so if you can, you should go for the Danby model or, even better, a larger compact fridge. The 1.6-cubic-foot Midea WHS-65L (Est. $100) also has a half-width freezer compartment, and this cube-shaped mini fridge gets a nod from TheSweetHome.com after hands-on testing. "It's a fine spot to store your lunch for a day or two," writes author Tyler Wells Lynch, noting that this tiny model is also surprisingly spacious given its small footprint. That said, we also found a number of user concerns about this model's noise and durability. Some complain that it died after just three or four months of use, and even Lynch waxes lukewarm about mini fridges in this size range, noting that there's not much variability between them. If you do buy the WHS-65L, register your warranty as soon as you receive the product. If you don't do so within two weeks, you lose your shot at the one-year limited warranty -- and if you do send the fridge in for servicing, you'll have to pay to ship it to the manufacturer. At this price range, you might be better off just buying another mini fridge or, better yet, saving up to go for a slightly larger and more reliable model like our best-reviewed Frigidaire FFPS4533QM. The only recent multiproduct tests of compact refrigerators come from ConsumerReports.org and TheSweethome.com. Because mini fridges have such a poor reputation for performance, we also leaned heavily on user feedback from sites like Lowes.com, HomeDepot.com, AJMadison.com, BestBuy.com, ABT.com, and of courseAmazon.comto evaluate how compact fridges operate in real-world conditions. Watch out for mini fridges that are labeled as "thermoelectric" or "superconductor" models. Check with your school before buying a mini fridge for a dorm room. Buy the largest mini fridge you can afford that will fit.